Ear Defenders - Protection against high noise levels. Earplugs are suitable for short-term work. Medium Vibration Risk Equipment - The amber range has been set at 5 to 10m/s2 allowing for two hours maximum daily use without further assessment. Products at the low end of the amber range may be used for longer periods but must be justified by a risk assessment. Electric - Ideal for clipping hedges in the smaller garden, this lightweight electric trimmer is safe and easy to use. 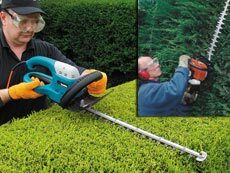 Petrol - Large hedges present no difficulties with this double-sided 2-stroke engined trimmer. Ideal for working away from mains power supply.